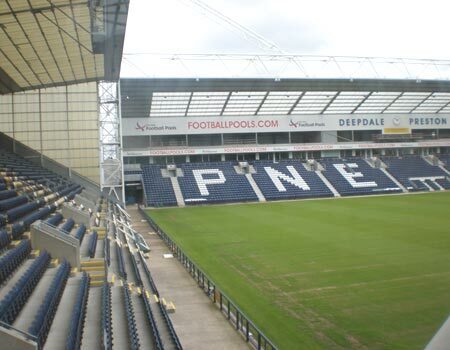 PNE's ground Deepdale, Bill Shankly Kop and Invincibles Stand from the ex-National Football Museum viewing point. A final day draw at home to Leeds who finished 13th. Losing to champions Burnley at home and away at runners up Middlesbrough. PNE could have got a few more points in April but overall 11th is a respectable position. North End have released 7 players and offered Brownhill a new contract. PNE also signed Fleetwood's goalkeeper Chris Maxwell, free, on a 3 year contract. Burnley up, Bolton down in the Championship. In League One, Wigan up, Blackpool down. In League 2 Accrington only needed a goal for automatic promotion but nerves seem to get the better of them. Holding a decent position in March with 2 draws a win and a loss. The draw with Brighton being the most reasonable result with a good chance of 3 wins in the other games based on position and what they could achieve. Scoring few and conceding few. So 4 points lost and 9 points from the play off positions. Doyle scored 2 of the 3 goals in March. Meanwhile Burnley are soaring at the top with 3rd place 4 points behind. At the other end Bolton are way behind almost certainly relegated with only 26 points and huge debts. In League One Wigan are 2nd and on a run while Blackpool and Fleetwood are in the bottom 6. In League Two Accrington are looking like being in the play-offs. Nearly all those teams have been in the Premier League but the North West has taken a hit in football since the recession. Is it coincidence in this recent era of small clubs doing well? Leicester at the top, Bournemouth, Swansea, Watford in the Premier League. A great run in February with 4 wins in a row after a draw, unfortunatey ending with a tight defeat at Cardiff. With PNE standing at 9th at one stage in the month. Johnson is top league scorer with Gallagher and Garner following. North End averaging almost a goal for and a goal against per match. The points tally is comfortable and only 7 behind the play-offs. Two clubs you'd think could do better are Leeds and Blackburn who are well behind PNE. With Leicester City top of the Premier League and Burnley top of the Championship it shows that success doesn't depend altogether on big cities and big money. Although Bournemouth and Swansea are also in the Premier league. January was a mixed month with a short decent run cruelly ended 1-3 with the first home defeat since November.?? Relegation is now 10pts below and the play-offs 12pts above.? The 3 promoted teams not having the greatest of starts with MK Dons 20th and Bristol City 22nd. January saw 2 wins, 1 draw and 1 defeat plus losing at Peterborough in the Cup.? At the end of December PNE emergency loaned Johnstone from Man U in goal after Pickford was recalled by Sunderland.? Johnstone was recalled and Anders Lindegaard has been loaned from WBA.?? PNE also loaned ex-PNE forward Callum Robinson from Aston Villa and winger Adam Reach from Middlesbrough until the end of the season.? Midfielder Ben Pearson signed a transfer from Man U and also from Man U defender/ midfielder Liam Grimshaw.? PNE have done their deals and it?s 5 additions. P24 W6 D10 L8 F19 A21 Pts28 - Position 17th. December was a big month with 6 games. Winning 3 and drawing 1 was a great result. The away win at Burnley and home win against Hull was exceeding expectation. Two defeats in Yorkshire with a sending off and 5 bookings against Leeds and 3 bookings against Huddersfield didn't look too good. Beating Rotherham at home with a 95th minute goal showed the jinx isn't Yorkshire. In the Championship Bolton have been in some difficulty with large debts and Blackburn aren't looking too inspiring. Burnley are well up. In League One, Wigan are in the play-off places while Blackpool and Fleetwood flirt with the relegation spots. In League Two Accrington are in the play-off places and Morecambe mid-table. P18 W3 D9 L6 F13 A16 Pts18 - Position 18th. November was another month with 'should haves' and a win keeping North End out of the red light zone. The home defeat to Blackburn was a disappointment as they'd been doing badly but had a new manager making a first showing. Two draws in London isn't bad. Garner got 2 goals that makes a start maybe. Six clean sheets in a row up to 21st Nov is pretty good for the defence. The other promoted clubs are beneath PNE and Bolton are bottom which seems a surprise. 10 points from the play-off places and 3 above the relegation zone. Football is favouring small clubs at the moment. It's not easy to say who should be up there. Bournemouth are a good example in the Premier League. Swansea as well. P14 W2 D7 L54 F10 A13 Pts13 - Position 18th. LDWDD in the league in October. Conceding no goals in the last 4 matches is good. Although scoring no goals in 3 of the matches isn't good. Also no wins at Deepdale as yet. A draw at home against bottom Bolton is a poor result really in what was reported as a scrappy and defensive game. The best result was a 3-0 away win at Charlton who have plummeted down the league. Kevin Davies retired from football. The end of a good career that PNE only saw the ending. Charlton, Rotherham and Leeds are having a very bad time at the moment. PNE can cling on to bad news elsewhere. People say they aren't playing badly but they aren't scoring much. Their style seemed more defensive and depending on breakaways. In this league you really need to put away any chances. With Notts Forest, QPR, Blackburn and Fulham coming up it doesn't look easy but none of those clubs is doing that well. P9 W1 D4 L4 F6 A10 Pts7 - Position 22nd. LDLD in the league in September. Also losing at home by penalties to Bournemouth in the League Cup. The three promoted clubs are sitting at the bottom in reverse order with Bristol City bottom. PNE have Beckford injured and Garner suspended. Neither have done anything this year, 6 goals in 9 games would suggest. This is a tough division and PNE are struggling to adapt. Games last to the final whistle and a tidy performance is needed right through. Graham Alexander was sacked by Fleetwood at the end of September in an early decision about their form. Not clear that changing managers always makes a difference, sometimes just a change is needed but often the new manager is still struggling with the squad inherited. With small gates and living on the life support offered by Trevor Hemmings PNE will probably be making the best they can with Simon Grayson perhaps right through the season. Let's hope he can turn it round. 1st September 2015 - Mixed start to season. P5 W1 D2 L2 F2 A4 Pts5 - Position 17th. DWDLL in August. Also two wins in the League Cup including one against Premier League Watford, brings on a home game against another Premier League club, Bournemouth. Losing to Ipswich and Hull in the Championship may not be unexpected but demonstrates that PNE have a way to go. Scoring 2 goals in 5 games is poor. Beckford who was injured, came back and was injured again is disappointing. The recent signing of 2 strikers looks to remedy it, May from Sheff Wed. and Doyle on loan from Cardiff. If it's any consolation Blackburn, 21st, and Bolton, 23rd, are below Preston, while Burnley are 9th. As of 9th Sept In League 1 Blackpool are 22nd, Wigan 9th, Fleetwood 10th. In League 2 Morecambe are 6th and Accrington 15th. In the Conference Southport are 22nd. In Vanarama North AFC Fylde 2nd, Chorley 13th. The pre-season games started well with 4 wins out of 4 but then lost at Carlisle. Next game at Bury. Greg Cunningham,? Republic of Ireland,? left back from Bristol City signed. Jones, Clarke, Huntington, Wright, Woods (Davies 59), Kilkenny (Welsh 72), Johnson (Browne 79), Gallagher (Brownhill 79), Beckford (Reid 72), Garner (Little 72), Keane (Hugill 83). Unused sub: James. PNE signed Jermaine Beckford 1st July. PNE loaned from Man U Will Keane. PNE loan goalie Jordon Pickford from Sunderland after Man U goalkeeper Sam Johnstone was undecided whether to try for his place at Man U. Full backs Laird and Buchanan left PNE at the end of their contracts. 1st July 2015 - Fixtures for next season. Preston North End return to the Championship, after 4 seasons in League One, and start with a home game against Middlesbrough on Sunday, August 9th at 12noon. A tough start with Middlesbrough ending last season 4th. The following Saturday they play fellow promoted MK Dons away. Followed by Rotherham away and Ipswich at home. The last game of the season is at Deepdale against Leeds United, 7th May 2016. The season brings derbies with Blackburn, Bolton and Burnley. The Championship is a tough league with some good teams with fat wallets.